Pani puri is a delicious Indian street snack. They are delightful, little, round, and hollow crispy puris. The puris are stuffed with a mashed potato mixture and then filled with spiced pani. 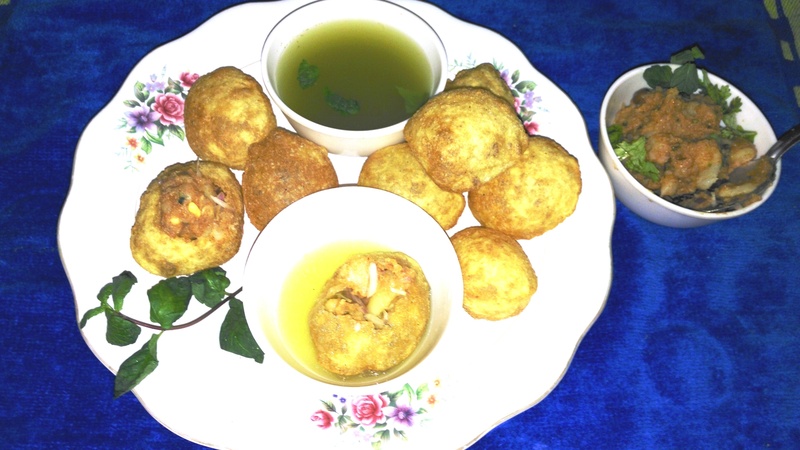 This pani puri recipe is my favorite snack and I enjoy making them at home with my family. Mastering the art of making perfect puri takes time. We prepare the puris in batches and store them in an airtight container to be used as and when required. Pani is the Hindi term for water. Panipuri is also referred to as gol gappa, fuchka and gup chup in various parts of India. Masala is the Hindi word for spice. Pani Puri Masala is simply adding the correct mixture of spices to the recipe. These spices are difficult to make and would require a whole new article but this one on amazon is pretty good. Puri is prepared from dough made of semolina and all-purpose flour. The dough is then rolled into small size puris which when deep fried in oil puff up into round hollow crispy puris. The potato stuffing is a mixture of coarsely mashed boiled potatoes mixed with dry spices, chopped coriander leaves, and onions. Boiled chickpeas and sprouts are also sometimes added to the pani puri recipe stuffing mixture. Ground herbs and powdered spices are mixed with water to prepare pani. Puris can be made in advance and stored in an air tight container. Feel free to add tomato ketchup or hot sauce to stuffed puri based on your personal taste. Puris stuffed and filled with spiced water are to be consumed immediately, else the puris turn soggy. You can use store-bought or homemade tamarind pulp. To make tamarind pulp, place ¼ cup tamarind with ¼ cup water in a bowl and microwave on high for 30 seconds. Allow the mixture to stand for 5 minutes. Place a sieve on a bowl and pass the mixture through the sieve to collect tamarind pulp in the bowl.